If you’re a fan of eating breakfast for dinner, Sweet Potato Pancakes are the dish for you. 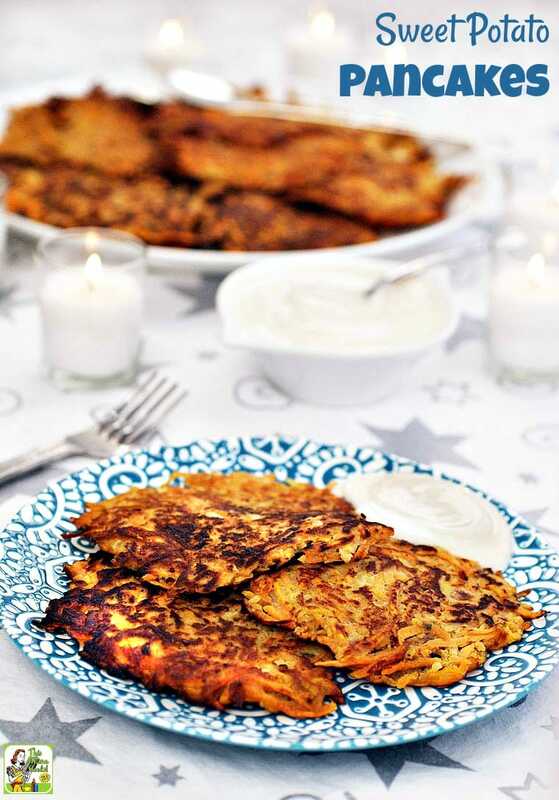 Whether you’re cooking these up for Pancake Tuesday or “just because we love pancakes!” these sweet potato pancakes are sure to be a hit. Sweet potato pancakes work as a meal all by themselves with a side salad or soup. Or you can serve them as a side dish with a chicken, turkey or beef dish. 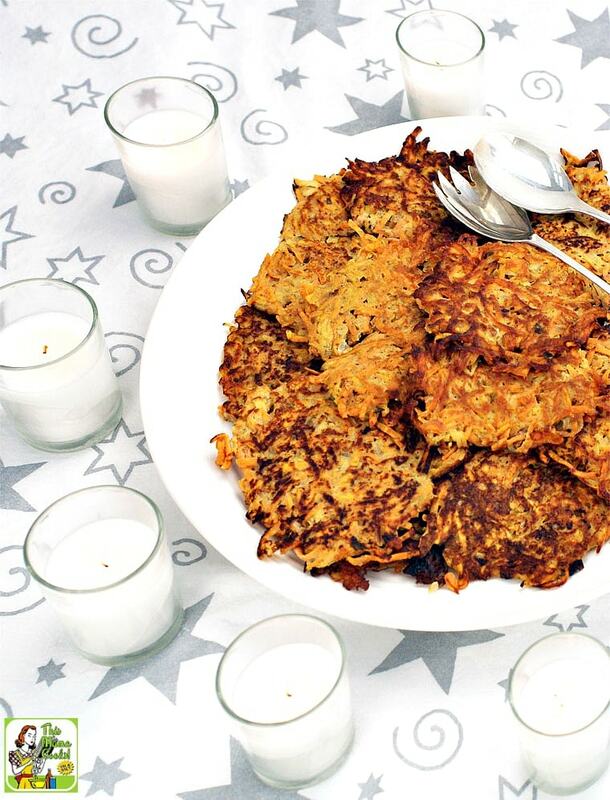 Plus, if you make these for Hanukkah, you can call them Sweet Potato Latkes! 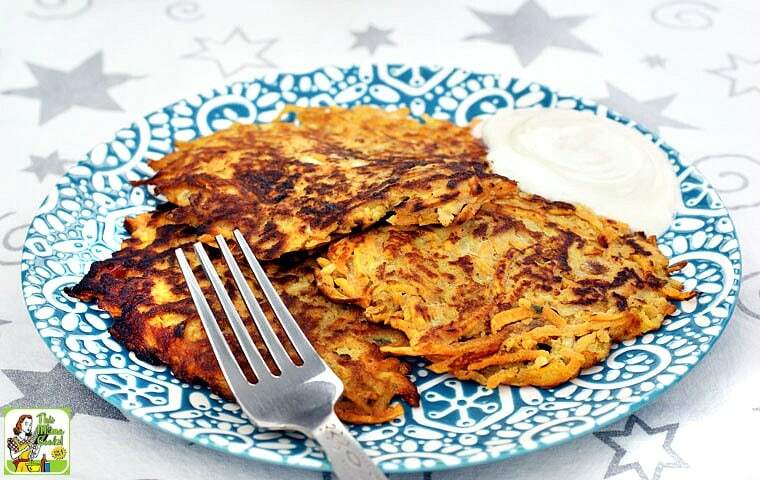 Best of all, this sweet potato pancake recipe can easily be made gluten free! What do you serve with your Sweet Potato Pancakes? I have a sweet potato pancake dilemma. Should I serve them with sour cream or apple sauce? After all, that’s what everyone eats with their regular potato pancakes. Since I like to health things up a bit, I usually substitute non-fat Greek yogurt for the sour cream. Tastes just as good and I don’t feel so guilty. As for the apple sauce, why not put apples right in the pancakes? Problem solved! Have you ever tried it? It’s a mix of SPLENDA with real brown sugar. Just be aware that when using SPLENDA Brown Sugar Blend in a recipe, it’s not on a 1:1 ratio with regular brown sugar. Instead, it’s about a half a cup of SPLENDA Brown Sugar Blend for every full cup of regular brown sugar. Why should you make Sweet Potato Pancakes? 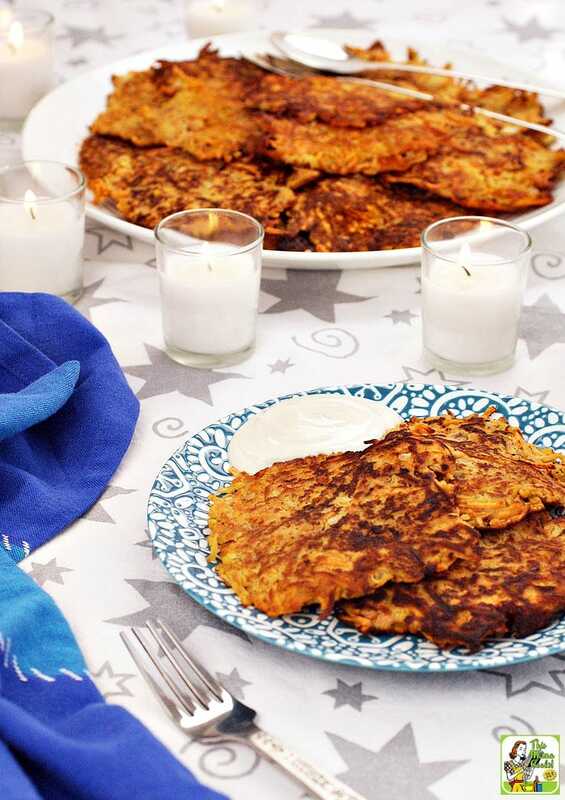 This sweet potato pancake recipe is a terrific way to use up any leftover sweet potatoes after a big holiday feast. Using up pantry items is the main reason we eat pancakes for Pancake Tuesday, also known as Shrove Tuesday, Fat Tuesday and Mardi Gras (which is French for “Fat Tuesday”). The logic behind the day is to take all the remaining rich foods in your kitchen such as eggs, milk, butter and sugar and turn them into pancakes to eat on the day before fasting begins for Lent. And did I mention how healthy sweet potatoes are? They’re a rich source of fiber, iron, calcium, selenium, B vitamins, vitamin C, and beta-carotene, and anti-oxidant. Please, please, please use a food processor to grate your sweet potatoes instead of a box grater. It’s worth getting it out of the pantry closet. Instead of a gluten free all purpose flour (my favorite is Bob's Red Mill Gluten Free 1-to-1 Baking Flour), you can use gluten free matzo meal. If you’re not gluten free, you can use regular flour or matzo meal. I used six large eggs in my sweet potato pancake recipe. To cut back on fat and calories, you can substitute 3/4 cup liquid egg whites for three of the eggs. As you scoop up the batter for each round of pancakes, make sure to stir the batter. I find that the egg mixture tends to settle at the bottom. So if you don’t stir, the last few pancakes end up being more omelet than sweet potato pancake. Coarsely grate the sweet potatoes and apples in a food processor fitted with a shredding disk. In a medium bowl, mix together the eggs, flour, brown sugar, cinnamon, and nutmeg. Heat a large, heavy skill over medium high heat until hot. Add 1/4 cup of canola oil. Drop 1/4 cup spoonfuls of the sweet potato mixture in to the skillet, then spread the pancakes flat with a back of a spoon to about 1/4-1/2” thick. Fry the sweet potato pancakes until they are brown on the bottom, about 3 to 5 minutes. Flip and cook the other side until crispy and brown, for about 3 to 5 more minutes. If needed , reduce the heat so the pancakes don’t burn. Add more oil if you find that the sweet potato pancakes are sticking. Place the sweet potato pancakes on paper towels to blot off excess oil. Keep warm in the oven until serving time. Serve with sweetened Greek yogurt. In a small bowl, combine the Greek yogurt and SPLENDA Brown Sugar Blend until thoroughly mixed and creamy. Keep chilled until serving time. Servings: Makes 21 sweet potato pancakes. Serves 6. Originally published on December 9, 2015. Updated with new photos and information. 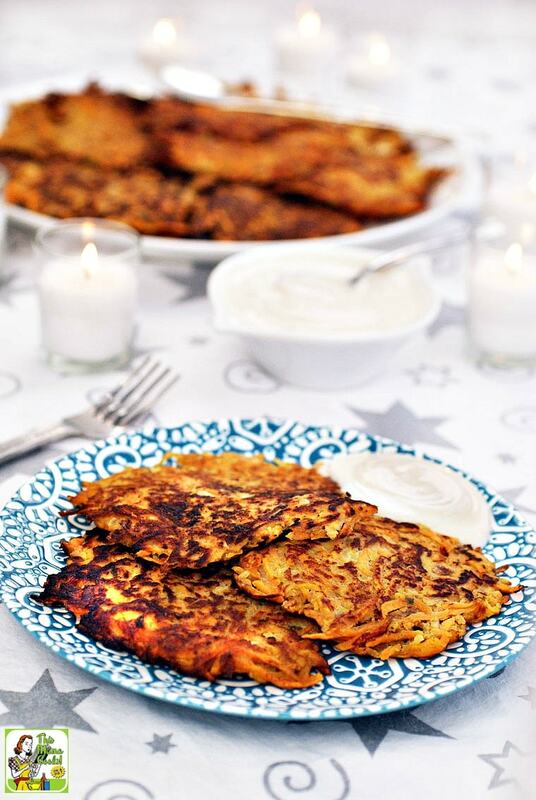 I love latkes at this time of year and these would not only be tasty but better for my waistline! I love latkes year round. Why wait for Hanukkah?